I recently invited my folks to dinner at our house. I made cute little individual apple pies baked in canning jars for dessert for them. But I had 1/2 jar of apple pie filling left and I needed to make sure it got used. Ya know, when that apple pie filling jar starts with the picking of the actual apples, you don’t want to waste any of it! 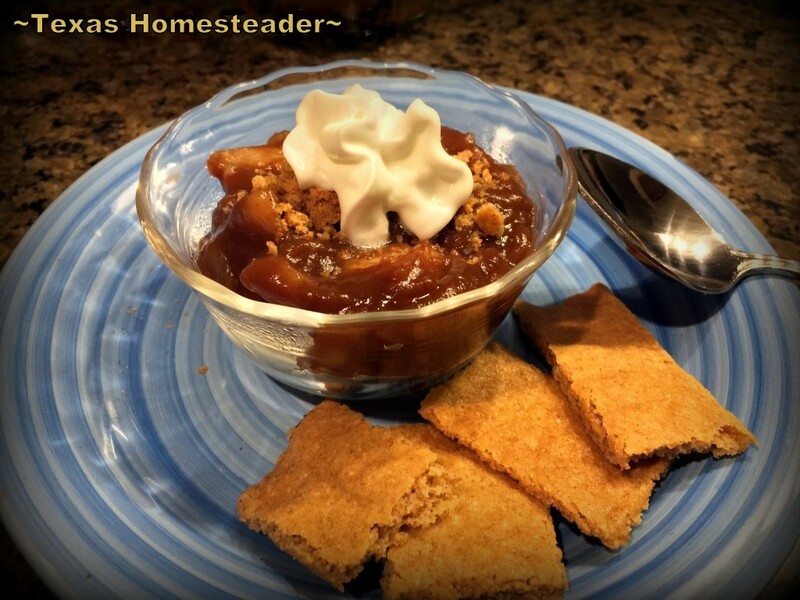 I decided to use it up making a simple dessert for RancherMan & me. I’d heat up that apple pie filling, put it on a bed of graham crackers and top it with graham cracker crumbs & whipped cream. Kinda like a quick No-Bake Apple Pie Dessert. But I didn’t have any graham crackers. So I sat out to find (and of course not follow, lol) a recipe using standard pantry ingredients. Although in past years my time was spent chasing a corporate career and raising children, I’m afforded more time now since we’re empty nesters living & working right here at the ranch. Life it still super-duper busy #dontgetmewrong. But being self employed, our budget is tight. Not being corporately employed, we now have more time than money. So I often opt for making things from scratch that I used to buy. These graham crackers only use standard pantry ingredients – no special purchases here! I think the key is in rolling them thin enough. Too thick & they’ll be like thin graham cookies without any crunch. But too thin & they’ll be like thin crispy crackers. I used a piece of parchment paper laid on my baking pan and a bread bag cut open for an easier non-stick way to roll out the soft sticky dough. The best texture was accomplished when I used 1/4 of the chilled dough at a time to roll into about 5″x15″ rectangles for baking. Homemade Graham Crackers For The WIN! But it was successful & my dessert was delicious! 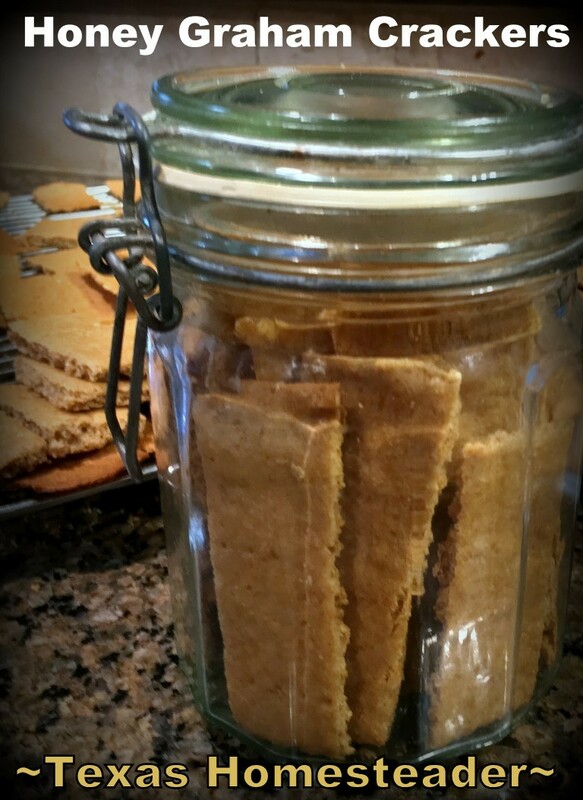 Plus we have lots of homemade graham crackers left for snacking. Yep, RancherMan has a sweet tooth so this is a big plus. And there’s no trash like there would be if I had bought the graham crackers with the box and all the little packages which is good for my environmental bend. Plus the cost is cheap, cheap, cheap! Oh, and who doesn’t love the taste of homemade?? All of this is reason these were a success. I don’t use margarine & was out of butter so I subbed butter-flavored shortening that I always have available in the pantry. Although the shortening worked fine I’ll probably use butter next time. Plus I really wanted it to be more honey flavored so I replaced the brown sugar with more honey. Perfect! Oh and I added cinnamon & sugar into the dough, although it was such a small portion there wasn’t much cinnamon flavor in the baked crackers. But RancherMan said it was perfect & not to change a thing. Sift together the whole wheat flour, all-purpose flour, baking powder and baking soda, cinnamon & sugar; set aside. Preheat the oven to 350 degrees F Divide the chilled dough into quarters. On a cook tray lined with parchment paper, roll the dough out one quarter at a time into a 5x15 inch rectangle. Divide into individual crackers using a knife or pizza cutter. Prick each cracker with a fork to allow steam to escape. For a sweeter cracker, sprinkle with additional cinnamon sugar mixture before baking. NOTE: These graham crackers are very lightly sweet. If you like them sweeter you can add sweetness by sprinkling additional cinnamon/sugar onto tops of crackers before baking. 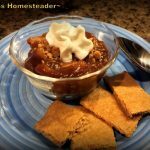 This entry was posted in Blog Posts and tagged Cooking, Environment, Frugality, Recipes on February 4, 2018 by Texas Homesteader. I use butter for all my baking and have for years. If a recipe calls for oil, I just melt it, and I have never had any complaints. I will definitely try this one, though. You said you’d do it, and you did! Congrats! I’ve been waiting for this, can’t wait to try it! dear Tammy, I just absolutely love the way you present your every day in your blog. You said you don’t use margarine, but shortening. There is some research done from another blogger (“weed em & reap”) on the ill effects on shortening. I have to say, that I do have shortening in my house and NOT margarine, but right now as I am switching over to sometimes more expensive alternatives, I have to just be careful as to how much baking I am doing using the shortening. My husband’s Grandmother made the awesome sugar cookies –which he loves –and cannot be duplicated with anything else but shortening. With that said, I would encourage you to look into it, if you choose, and see for yourself if you can find the alternative. You always say, “use whatcha got!” and I would love to see what you find works without using shortening. Are you up for the challenge? Agreed on the use of butter. I guess what I was saying in my head (no, you do not know this,not being a mind reader and all) is that when I use butter, I can not seem to get the ratio of flour to make it so the whatever recipe is to NOT be greasy. Does your use of butter in your recipes have this problem. Sorry, I did not give you the whole thought behind the comment … in no way did I intend to gloss over your statements in how you would create the recipe next time.